Roti canai is normally sold for between RM1 and RM1.50 a piece, but at Roti Canai Kayu Arang in Bachang here, you will get crispy roti canai for only 80 sen. The secret to the crisp and slightly burnt aftertaste lies in how it is prepared. 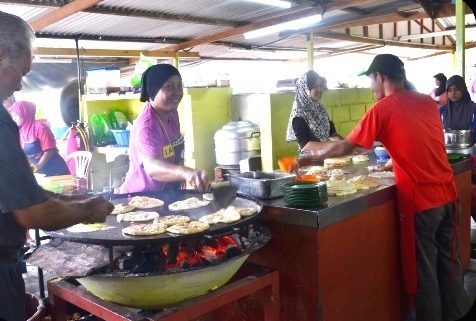 Owner Siti Idah Talib, 42, has been using charcoal to heat up the griddle for the last 16 years. The charcoal is brought from Kuala Lumpur and costs more. Despite that, Idah has yet to hike the price of the roti kosong, her bestseller. Siti Idah offers various types of roti canai, including roti tampal, roti telur and roti nanchos, with prices ranging between 80 sen and RM5. “Although other outlets sell roti kosong for RM1 a piece, I still maintain the old price. I used gas for a short period but my customers prefer the slightly burnt aftertaste from the use of charcoal so I have reverted to charcoal. Ali Abd Hamid, 57, a frequent patron, enjoys the roti canai here as it has a different taste. “Siti Idah needs to pay close attention when frying the roti canai, or it will get burnt easily as charcoal is hard to control unlike gas. Another customer, Yvonne Chong, 34, found out about the stall from Facebook and decided to give it a try. 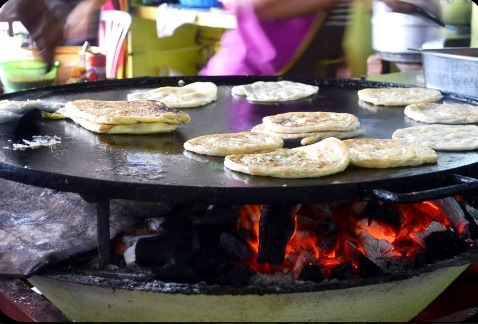 A regular customer, Noor Azizah Berahim, 47, from Kuala Lumpur, said her trip to Malacca would not be complete without dropping by at the stall for its roti canai and nasi lemak. “Even if it is a one-day trip, I will still come,” said the Malacca-born freelance counsellor. She said she had frequented the stall for several years and would recommend it to her friends. The food stall, which can be found by the AMJ Highway near Bachang, opens daily from 6.30am to 12.30pm. Idah also sells lontong, curry noodles, soto, otak-otak, satay and traditional kuih.